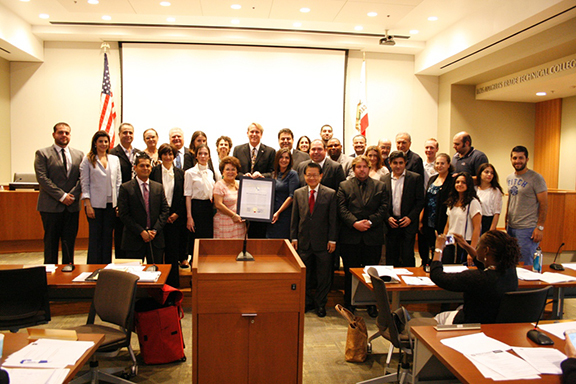 During a special meeting on Wednesday, the Los Angeles Community Colleges District Board of Trustees adopted a resolution designating the month of April 2015 as “Los Angeles Community College District Month of Commemoration of the 100th Anniversary of the Armenian Genocide of 1915” reported the Armenian National Committee of America – Western Region. The very strongly worded resolution also incorporates Armenian Genocide education and awareness as part of the district’s teachings and campus activities, and calls on the United States President to work toward equitable, constructive, stable, and durable Armenian. Turkish relations based upon the Republic of Turkey’s full acknowledgment, with reparations, of the facts and ongoing consequences of the Armenian Genocide, and a fair, just, and comprehensive international resolution of this crime against humanity. “This is very personal to me because about 16 years ago I had the opportunity to work on a bill that hangs in my office, to recognize and authorize the education of teachers so that they could be trained to teach about the Holocaust and Genocide education. It is probably one of the proudest pieces of accomplishments in my public life. And today, there is no prouder moment as a Jewish American to stand with my brothers and sister in the Armenian community to recognize their tragedy, recognize this genocide, ” stated Board President Scott Svonkin prior to roll call. After introductory remarks made by Board President Scott Svonkin and Co-Sponsor of the Resolution and Vice President of the Board Steve Veres, representatives from community organizations including Executive Director of the ANCA Western Region Elen Asatryan, Chair of the Armenian Relief Society Western Region Becky Berberian, Board Representative of the Armenian Youth Federation – Western Region Talar Kossakian, Co-Chair of the ANCA WR America We Thank You: An Armenian Tribute to Near East Relief Committee Vanna Kitsinian, and past Chair and Member of the California Community Colleges Board of Governors and current ANCA WR Education Committee Chair Alice Petrossian took the floor to offer testimonies in support of the resolution. “On the eve of the centennial of the Armenian Genocide, adoption of this resolution by the Board of Trustees will go a long way toward ensuring that the LACC community—faculty and staff—become aware of the first modern genocide. Study of 20th Century world history would be incomplete without familiarity with the Armenian Genocide, its impact on global events, and subsequent genocides then, and also the manner in which it has shaped and affected the Armenian American community of California,” stated Asatryan in her remarks prior to calling for unanimous passage of the resolution and thanking Vice President Veres, Trustee Santiago and President Svonkin for their leadership and support in spearheading the resolution. “We are looking forward to collaborating with the Los Angeles Community College District Board of Trustees in the organization and implementation of campus wide educational events and programs to help educate the students of the Los Angeles Community College about the Armenian Genocide. By educating today’s youth about past genocides, we are ensuring that tomorrow leaders will fight for a more just and peaceful world,” added Kossakian in her remarks. “This is as much a part of American history as much as it is a part of Armenian history. Personally as a resident of Los Angeles and a former student of LA Valley College, I truly believe that a community college should come up to speed with the high school curriculum, mandate, and standards of high school education and pass this resolution,” noted Kitsinian. “I look forward to making certain that every community college system follows your model and in fact I know of two that will be following very soon, so in fact you will be the model for our state,” stated Petrossian. After the close of the public comment portion, Trustees, one-by-one added their resounding comments in support of the resolution prior to its unanimous passage. “This isn’t the first time it’s been recognized as a Board, since this is the 100th year centennial anniversary, this is certainly something that we are extremely looking forward to as an education effort and will bring to the absolute limelight critical messages and education points that should help us and help humanity for the future,“ stated Vice President of the Board of Trustees before making a motion to approve the resolution. “As the largest community college in the nation, we wanted to set the tone that a 100 years is certainly a long time for some, but it’s also a very short time to heal a culture and to heal the people’s horrific period in our world history. It’s something that should have never happened and should not re-occur to anyone and it’s that word that’s very largely used but it’s very recognizable because it did occur and that was a genocide to the Armenian people and culture,” stated Co-Sponsor of the resolution, Trustee Miguel Santiago. “I have to say that this is one of the most powerful and emotional resolutions this board can present and I thank my colleagues for signing on to this and helping us lead that for i know that there are other board members that would have signed on so I’d like to thank them too,” added Santiago. Though Trustee Nancy Pearlman provided supporting arguments for the Genocide Resolution and later voted in favor, she used her time to speak to share about her recent visit to Azerbaijan, filling the room with false propaganda provided to her by the Council General and the Government of Azerbaijan. In the months leading to today’s vote, the ANCA Western Region worked hand in hand with its grassroots and the College District to make today’s victory and recognition possible. The language of the resolution, as adopted may be found on the ANCA WR website. The resolution will affect all 9 community college campuses under the jurisdiction of LACCD, including East LA College, LA City College, LA Harbor College, LA Mission College, Pierce College, LA Southwest College, LA Trade -Tech College, LA Valley College, and West LA College.